The importance of good nutrition for your child cannot be understated. It builds her immune system, keeps her at a healthy weight, and contributes to optimal development. When you’re feeding her nothing but breastmilk or formula, you know she’s getting everything she needs. But when it’s time for solid foods, how do you feed her in a nutritious way that promotes healthy eating habits? Breastmilk or formula should be the primary source of nutrition until age 1. Be sure your baby drinks 22-32 ounces of breastmilk or formula every day, in addition to any solid food. For breastfed babies, include foods high in iron after starting solids. Around 6 months of age, breastfed babies need additional iron. The AAP recommends including iron-rich foods like fortified, single-grain baby cereals and well-pureed cooked meats in your baby’s diet. Choose whole foods (as close to their natural state as possible). When your little one is eating purees, be sure they contain only cooked, pureed food and water, breastmilk or formula. When she graduates to eating food she can chew, go easy on processed foods. They tend to be less nutritious than whole food, and often contain a lot of sugar. Clever marketing has resulted in a wave of “healthy” processed foods, like crackers with sweet potato cooked in. In this example, it’s always more nutritious to give your child soft pieces of cooked sweet potato. Offer a variety of foods. Until age 1, offering different types of food is more about exposing your baby to different flavors and textures than ensuring balanced nutrition. After her first birthday, however, a variety of grains, fruits, vegetables, and proteins is the best way to deliver the calories, vitamins, minerals and essential fatty acids she needs to grow, develop, and thrive. For detailed information about food groups and portion sizes, the USDA has a great tool called MyPlate where you can find daily food checklists for any age. Don’t forget that sometimes little ones need to try a new food up to 15 times before they accept it. If your child scrunches up her face after tasting spinach, don’t give up! Keep offering it on other days, even just a bite-sized portion. Allow her to feed herself. As soon as she can grasp a spoon or pick up food, allow your child to feed herself. This encourages her to choose what and how much she wants to eat. Forcing her to eat when she doesn’t want to is a big nutrition no-no, as it can lead to obesity (and even eating disorders) down the line. As a bonus, self-feeding helps develop hand-related fine-motor skills and encourage age-appropriate independence. If you’re worried about your child eating enough, a good rule of thumb is that if she’s growing on-track, she’s getting enough food. If you’re worried about her not eating enough of a certain food group, offer her more variety within the group. For example, if she tends to reject vegetables, offer her two vegetables at mealtime instead of one. Also, keep reintroducing things she’s rejected before. If concerns about eating habits persist, check in with your pediatrician. Hold off on juice before age 1. The AAP recently modified their recommendations about juice, saying it should be off-limits until age 1. They cite trends in obesity and poor dental health, and say the high sugar content of even pure juice is too much. After age 1 it’s okay to introduce 100-percent pure juice, but only 4 ounces per day as part of a well-balanced diet. Hold off on cow’s milk to drink before age 1. Cow’s milk offers 1 year-olds and older nutrients like protein, calcium and vitamin D. Before that, though, it doesn’t have enough of what babies need, so breastmilk or formula should be the only thing babies less than a year old drink. Hold off on honey before age 1. Honey may contain bacteria that can cause serious illness in infants. Include your child in family mealtimes. 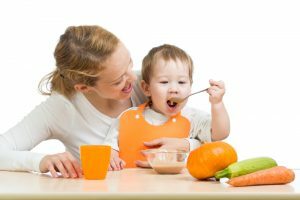 When you eat with your tot, you can model how to eat controlled portions of healthy food at specific times. Eating together as a duo or family also has numerous language and social benefits. Plan vegetarian and vegan diets carefully. A child can be well-nourished on a diet that restricts animal sources, but it requires careful planning. Common deficiencies associated with these diets include protein, calcium, iron, zinc, and vitamins D and B12. Your pediatrician or a licensed nutrition professional can help you map out a plan that ensures your little one gets enough of what she needs. As you embark on this adventure into the world of food, remember that your child will go through phases. It’s common for toddlers to suddenly reject something they gobbled up as babies, and her appetite may shift from very hungry to less hungry and back again. Experts say to stay the course: Continue feeding your child a variety of nutritious foods that lay a healthy foundation for these important first years of development.